When high winds hit, the first thing you probably do is cover yourself up, lock the doors and windows, then go back to watching that amazing movie with a hot cup of coffee in hand. Rarely do people ever think about the importance of a roof in such scenarios or the effect the high winds have on it. When constructing houses, particular attention should be given to the roof as it not only acts as a top cover for the house but also protects occupants from the elements. Wind damage is any destruction caused by high winds or windstorms. The unpredictability of high winds makes protection of the roof difficult but not impossible. You are probably wondering how high winds cause damage to your roof. Since roofs are usually not flat, high winds tend to hit the edges and the corners of the roof harder. Shingled roofs are more susceptible to wind damage. Depending on the strength of the high wind, nails holding the shingles come loose, leaving the shingles curled up and even ripping some of them off. Branches of trees hanging over the roof constantly rub against and sometimes drop dead twigs against the shingles, causing the nails to weaken and also drop twigs and leaves which accumulate over time causing roof damage. High winds have a considerable tendency of carrying debris which hit against the shingles on the roof, some of which remain there and accumulate over time. One ripped shingle could cause damage to other roof pars as the winds can now move underneath the rest of the shingles causing damage from within. High winds are sometimes not strong, so if the roof is not checked continuously, damage caused could be more extensive than it seems. Most of the time, wind damage to your roof is gradual, which means chances of spotting the damage as soon as it occurs are low. How then do you know your roof has been damaged by high winds? Insurance companies will cover a large portion of wind damage to shingles, gutters and downspouts, and actual holes in the roof left behind by the storm. These are some of the signs you should look for that indicate your roof may need repair. Leaking roofs- when high winds rip off shingles, your house is left unprotected from the rain. Water dripping from the ceiling or attic could be a sign that some part of the roof has been damaged. Curled up shingles on the roof edges and corners- corners of roofs are hit by high winds at a greater pressure than the rest of the roof. This causes the shingles on the roof edge to curl up. Curled shingles are not easily spotted from the ground, so it’s difficult to determine if the roof has been damaged or not. They are only noticeable through routine checks on the roof. Loaded gutters- debris from high winds, damaged shingles and loose nails and dead twigs and leaves from trees mostly end up in the gutter. If you spot them when cleaning out the gutter, then it could be a sign that your roof is damaged. Missing chimney flashing- high winds tend to blow them off or split them. Lifted shingles- nails holding the shingles become loose when high winds cause a suction effect on the shingles. This leaves the shingles looking like they have been lifted up. From the ground, you cannot tell they are lifted, so it is important to conduct routine roof checks. Blown off roof- this is mainly caused by extremely string high winds. Poor roofing also increases the chances of having your entire roof blown off or sometimes cave in. It is no secret that roof repair is expensive. Though you cannot entirely protect your roof from wind damage caused by high winds, you could use the following precautions to prevent extensive roof damage. Routine inspections- if you live in an area prone to high winds, your roof is at high risk of being damaged. Since the effects of high winds on the roof are rarely noticeable at once, regular routine checks are recommended. This will reveal the extent of the damage giving you enough time to do repairs before the damage becomes extensive. The inspection should not only be done on the rooftop but on the underside as well. Secure roofing- a secure roof is bound to withstand high winds for longer. The nails holding the shingles should be hammered in straight and not too deep and the sealant strip, holding the shingles, should be clean to ensure maximum adhesion. 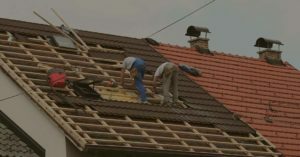 The roofing should also be done by professionals using high-quality materials. Trimming trees and bushes hanging over your roof- branches constantly rub against the shingles during high winds and end up loosening the nails, lifting shingles and leaving debris. Always ensure trees are well trimmed, and no branches are hanging over the roof. If possible, ensure bushes and trees are planted a safe distance to the roof. Seeking professional services- seeking professionals is not a sign of weakness but is the safer option. Repairing a roof without professional knowledge is both dangerous for you and could cause more damage to the roof. Professionals know exactly where to look and what to do. When conducting roof checks, safety is always important and a priority. Always wear all kinds of protective clothing including gloves and goggles. Roofs are dangerous places to walk on, and one could slip very fast and fall from a wet and damaged roof. It is always advisable to hire a contractor to conduct the inspections for you. Irrespective of the velocity of the high winds experienced in your area, roof damage is bound to occur. When building a house, it is essential to ask yourself. “If a tornado or hurricane occurred today, would my roof withstand it?” If the answer is no, then you need to seek out professionals for a better roof. A house is no good with a damaged roof no matter the extent of the damage. The Roof Replacement Pros can handle any type of wind damage you may have, and will work with the insurance companies to cover the cost associated with repairing or replacing your roof when caused by severe weather such as high winds. We currently have roofing contractors available to help you with any type of roof damage in Rockville, Columbia, Montgomery Village, Frederick, Germantown, Gaithersburg, Olney, Potomac, Silver Spring and Wheaton. If your home has been damaged by high winds and heavy rains, contact us before you contact your insurance company. We know what they are looking for when it comes time to approve or deny your insurance claim.